The belt grinding and polishing machines of the SMG 56 series are versatile with their different motor outputs. The SMG 56 series is a universal machine for industrial use due to its double-sided design with optional combination of belt grinding and polishing, belt grinding only or polishing only. Highlights are the two built-in motors, which can be switched off separately and drive the split spindle shafts of the machine. Each shaft can be preset with three different speeds via V-belts. The stable design of the SMG 56 series guarantees continuous, vibration-free operation during the machining process. 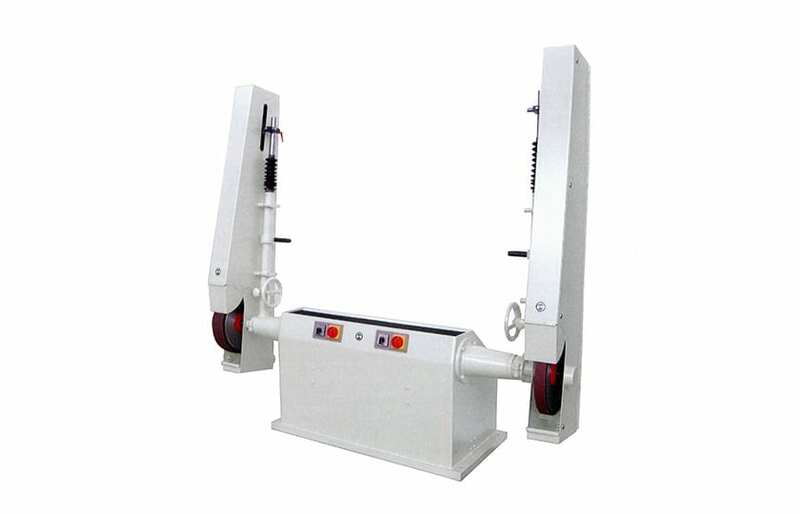 The belt grinding and polishing machine can be equipped with a low column (600 mm) or with a high column (1,000 mm) of the stand. The machine is always supplied in a double-sided version. Extension possibilities for belt grinding and/or polishing can be added quickly and easily. The SMG 56 series is equipped with two motors integrated in the stator and has split spindle shafts. The motors can be switched off separately. Each spindle shaft can be preset with three speeds in the range from 1,200 to 3,500 rpm via the respective V-belt drive. It is also possible to set different speeds on the left-hand and right-hand spindles.